Well, we are about to embark on our 1st camping trip with 3 kids.....think of me won't you!!! Today, I went on a last minute shopping trip to by wellie boots for the kids. I was amazed at the wonderful colours and designs that are now available but ended up with plain green wellies for the kids....boring! I am hopeful for sunny weather but as our past holidays in the UK have been wet and cold I am now prepared for all weathers (especially rain)!! 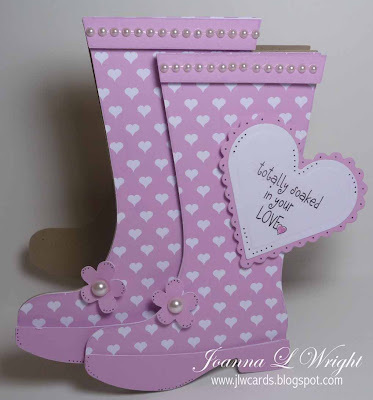 Anyhow, I saw this amazing Rain Boots Shaped Card Template - Cutting File Set at The Cutting Cafe. Regina has made a lovely pair so go and take a peek. I am a sucker for shaped cards so I couldn't resist this one. The greeting I used is from the Rain Rain Go Away set which features 33 images. I printed out the greeting and then used my heart shaped nestabilities to cut it out, so quick and easy. The boots card is a precious idea! OMG this is adorable! I knew when I seen Regina's file that you would come up with something amazing and sure enough, I was right! Cute, cute, cute...I made some too. They're just too much fun! My local papercraft shop where I buy most of my paper, cardstock and embellishments. Shaped Christmas Card Set - give-away!